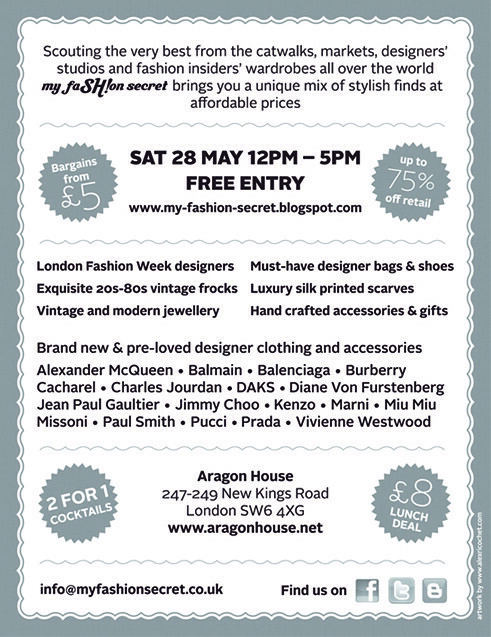 My Fashion Secret: MY FASHION SECRET POP UP SHOP IS BACK!!! Join us for a fun day of bargain designer shopping, dressing up, drinking cocktails and learning make up tricks from professionals. With the weather on our side, we’ll all be sunning ourselves in the garden with a glass of something chilled while leisurely browsing HOT fashion from exciting new designers and big name brands. All the ingredients for a perfect Saturday – DON’T MISS OUT! Stay tuned – much more to come! !